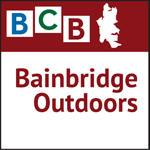 If you have ever wondered what happens at the West Sound Wildlife Shelter, BCB host Annie Osburn takes you inside in this episode of “Bainbridge Outdoors” for a look at Western Puget Sound’s only wildlife hospital and education center. Joining Osburn are executive director Lisa Horn, operations manager and wildlife rehabilitation specialist Lynne Weber, and hospital manager Brandy Stier, on location inside the hospital and on the grounds. 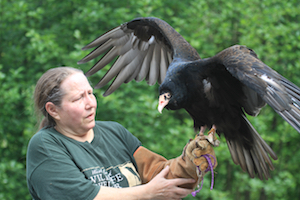 Lynne Weber, operations manager and wildlife rehabilitation specialist, with resident turkey vulture, Remington, one of the Wildlife Shelter’s education ambassadors. The main focus of the West Sound Wildlife Shelter (WSWS) is to rescue and rehabilitate wild animals located throughout Washington State who have either been injured, orphaned or have fallen sick. 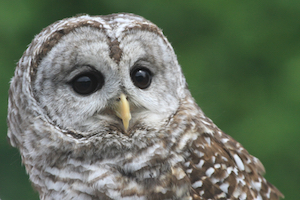 Athena, the barred owl, beloved Wildlife Shelter education ambassador. In 2013, WSWS finished the year having treated 1,118 patients, which amounted to 15,000 patient days. By the end of August 2014, WSWS had treated more than 1,250 animals and is expecting that number to reach 1,350 by the end of 2014, with patient days close to 20,000. 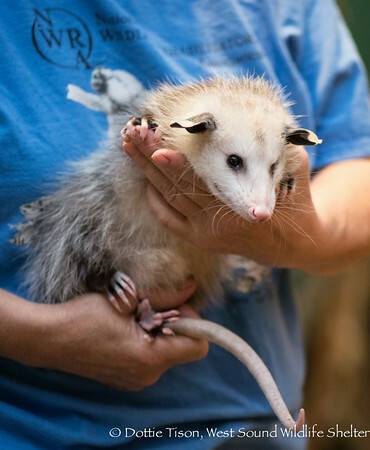 Luna, the Virginia opossum and Wildlife Shelter educational ambassador. Among the non-human guests joining this episode are Athena, the barred owl and WSWS educational ambassador, who came to the shelter after having been hit by a car. Remington, the turkey vulture with a six-foot wing span, was found near Shelton by a hunter after being shot. Weighing about four pounds, DNA tests proved Remington to be female – much to the delight of Weber, who knew “he” was a she, all along. Finally, we’ll meet Luna, the Virginia opossum, the first mammal educational ambassador at the shelter. As an omnivore, Luna enjoys a varied diet, which works to her advantage as she reportedly gets bored easily. Luna came to the shelter after having been attacked twice by a dog. She is blind in one eye and a portion of her tail had to be amputated. Still, she looks pretty darn cute waddling through the pine needles in her pink harness on daily walks around the grounds. 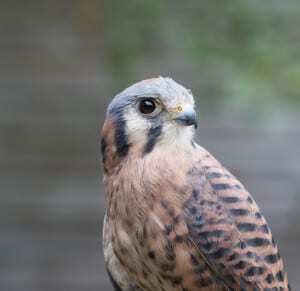 “Pele,” an American Kestrel, which are the smallest falcons in Washington State. For further information about the work of WSWS and volunteer opportunities, visit the Wildlife Shelter website. They are located adjacent to Bloedel Reserve (map). Credits: BCB host and text author Annie Osburn; BCB field tech and audio editor Tim Bird; BCB social media publisher: Barry Peters; photos by Dottie Tison, courtesy of West Sound Wildlife Shelter. Jake’s Pickup – healthy organic locally sourced comfort food at a gas station!